Many thanks to everyone who braved the snowstorms to drop by our booth and say hello. We met a lot of interesting people doing some really great science and we’re grateful for all the positive feedback you gave us. Hopefully see you all next year! Photo (above). Jack, an engineer, trying to do an impression of a salesperson. 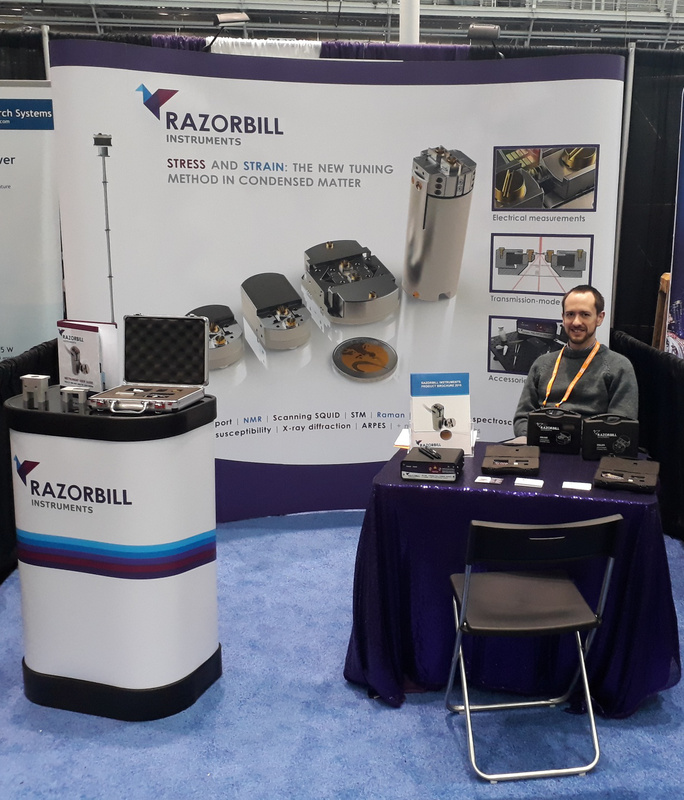 We are very pleased to announce that Razorbill founders, Alex and Jack, will be staffing booth #205 at APS March meeting. We will be unveiling and new product and be on hand to answer your technical queries and swapping hints and tips to getting the most out of your strain and stress cells. Please drop along and say "hi". We'd love to see you and you can admire our 'unique' purple sequined booth table! In the past few months, Razorbill Instruments became 4 years old. We have emerged from the choppy waters of a newly formed company and are secure, growing and continuing our commitment to developing high performance scientific instruments. Reflecting on the past year we can say that the company has achieved a great deal. We released a new product, the high-performance stress cell, the FC100. Customers bought the cell for the very high forces available in the one-inch package and the ability to precisely measure the force applied to samples. Many thanks for your patience as we took a little extra time than expected in getting the high volume of devices manufactured and sent out and thank you for patiently giving us the opportunity to resolve some of the early technical hiccups. 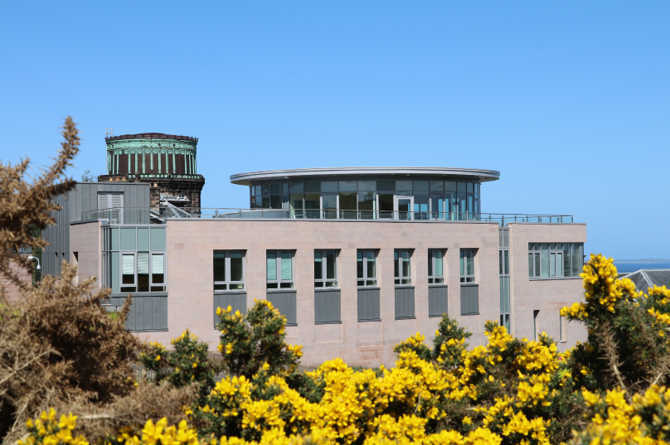 Razorbill Instruments also had the pleasure of migrating to a brand-new facility – the Higgs Centre for Innovation, remaining in the beautiful, rainy, City of Edinburgh. The additional space allowed us to add a new R&D engineer to our team who is developing and improving our existing sensor technologies. 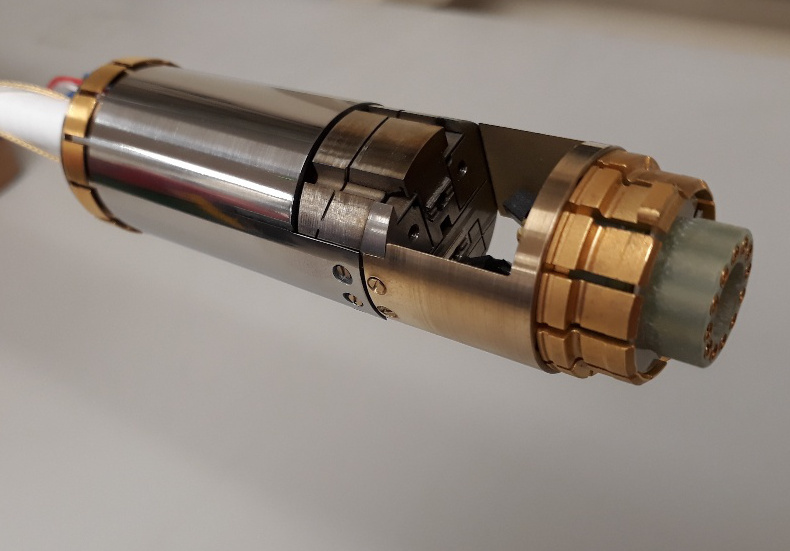 There have also been several developments in the past year in the academic world of uniaxial pressure tuning, and it is always very gratifying to see our customers producing high quality scientific publications. After, previously demonstrating how a CS100 can be used in conjunction with an NMR probe in an RSI paper, researchers at UC Davis, TU Dresden, Ames lab and the University of Minnesota identified some remarkable electronic transitions in BaFe2As2 publishing in Physical Review B. The combination of NMR and uniaxial strain appears to be a very fruitful research vein as many of the same authors were joined by colleagues at the same institutions to publish some additional high-impact results arising from tuning the electronic properties of BaFe2As2 with uniaxial strain in Nature Communications. It has also been a busy year for our academic partner, Dr Clifford Hicks and his research group at the Max Planck Institute for Chemical Physics of Solids. He has authored numerous publications using novel uniaxial strain devices that have been recently developed in the academic environment (many of which will soon be commercially available from Razorbill Instruments). Please follow the links to see the full author list whose hard work led to the publications. Dr Hicks published once, twice and then three times in Physical Review B, as well as Physical Review Letters. Most recently he has published in Science in which he and his colleagues used uniaxial strain in conjunction with high-resolution inelastic x-ray scattering to through light on the complex electronic phases of the high-temperature superconductor YBCO. It seems like exciting results are appearing on Arxiv every few days, so its looking like uniaxial strain tuning is really going to be an exciting research area to be in 2019 and beyond! A view of Razorbill Instruments' hilltop home (on a rare sunny day). There is much rejoicing in the field of strongly correlated electron systems as the first models of our brand-new premium product, the FC100 are being shipped to customers. Many thanks to all our loyal customers who have patiently waited (and are still patiently waiting). Thanks for bearing with us, and we hope to fulfil all outstanding orders in the next few weeks. The FC100 is a big step up in the field of cryogenic strain tuning. The device packs quite a punch into a 1-inch footprint providing a maximum displacement of ±25 μm at 4K and maximum force of ±90 N at 4K. On top of this, the FC100 has an in-built force sensor (instead of the displacement sensor) which allows the direct measurement of stress on the sample – a more reliable metric than measuring the applied displacement. Below shows the beautiful FC100 mounted on a modified Quantum design PPMS probe, ready for inserted into a cryostat. Researchers at the University of California, Davis with collaborators from Institute for Solid State Physics, TU Dresden and Ames Laboratory U.S. DOE have recently reported the observation of an intriguing magnetic phenomenon in the superconductor, BaFe2As2 which has a nematic electronic structure. The researchers were subjecting a sample of the material to uniaxial strain using a Razorbill Instruments CS100 strain cell (see picture) while probing it using NMR. BaFe2As2 is usually an anti-ferromagnetic material, with the atomic spins of neighbouring atoms alternate between up and down meaning that the spins cancel and resultant material is non-magnetic. Intriguingly, when subjected to strain the atomic spins changed significantly, moving out of the plane of the crystal leading to a strained material that is measurably magnetic. Materials that change their magnetic properties when subjected to strain are very rare but the particularly surprising effect is that an in-plane applied strain can lead to an out of plane magnetic moment. One of the reasons why the work is so significant is that this is the first measurement that sheds any light on the internal spin structure of the nematic order parameter in an iron-based superconductor. For more details please see the original paper which was published in Nature Communications or the UC Davis blog post on the work. Image left. Above: A sample of BaFe2As2 is mounted between the sample plates of a Razorbill Instruments CS100 strain cell. Below: As uniaxial strain is applied to the sample, the original in-plane magnetic moments (black arrows) start to shift out of plane (white arrows). Razorbill Instruments will be attending APS March meeting in LA this year. Come along to booth #221 say hello, and learn about our exciting new products. The Centre for Doctoral Training in Condensed Matter Physics (CM-CDT) have today announced several new fully funded PhD positions for candidates interested in working with the highly technical field of hard condensed matter physics but also have a keen interest in commercialisation and the desire to experience the atmosphere of a small but quickly growing start-up. 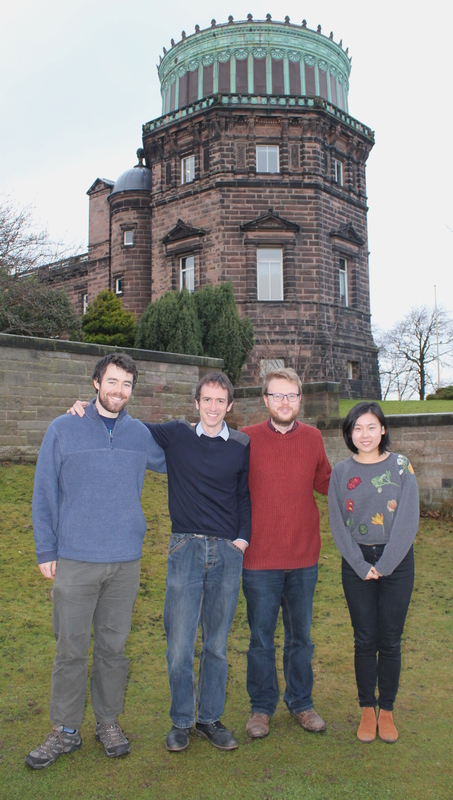 The project will many take place at the University of St Andrews and be supervised by Dr Peter Wahl, a world-leading researcher in cryogenic scanning probe microscopy. During the project the student will be responsible developing cutting edge cryogenic apparatus and then to both use these newly developed tools to explore new areas of science but also to take the first steps into turning the technology into a saleable product. We are pleased to announce that one of the original three founders of Razorbill Instruments, Dr Clifford Hicks has won the 2017 Young Scientist Prize in Low Temperature Physics awarded by the International Union of Pure and Applied Physics. He will be awarded the international award, which is only awarded once every three years, for his ground-breaking work in the application of uniaxial strain to unconventional superconductors. 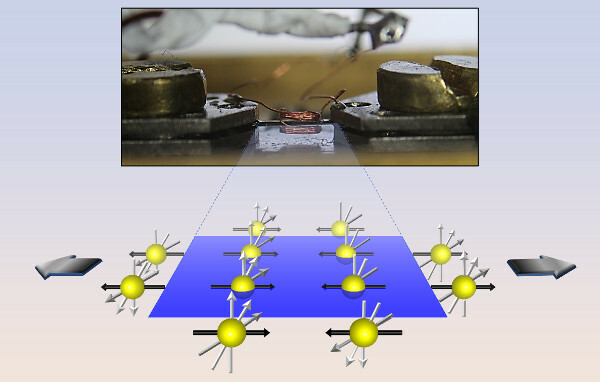 This technique, that he pioneered, has introduced an entirely new tuning parameter to manipulate the electronic properties of these exotic materials in order to shed light on their poorly understood electronic properties. The work has so far garnered him international acclaim and authorship on many high profile publications including two articles in the journal Science. His work has kicked off an entirely new and highly productive avenue of research in condensed matter physics. We would like to wish him congratulations on this latest recognition. The Young Scientist Prize in Low Temperature Physics has been been running for more than 70 years and is designed to recognise researchers who have performed exceptional research and have less than 8 years of research experience following the award of their doctorate. Professor Kyle M. Shen, Science, 355, (6321), 133. 13th January 2017. Already in 2017, there have been some very interesting research published using the application of uniaxial strain. Steppke et al, use a uniaxial strain cell to tune the electronic properties of the consistently intriguing unconventional superconductor, strontium ruthenate. The team found that under uniaxial strain there was not only a large increase in the critical temperature of the superconductor but some tantalising signs that the parity of the superconducting charge carrier changes from an even to an odd parity. 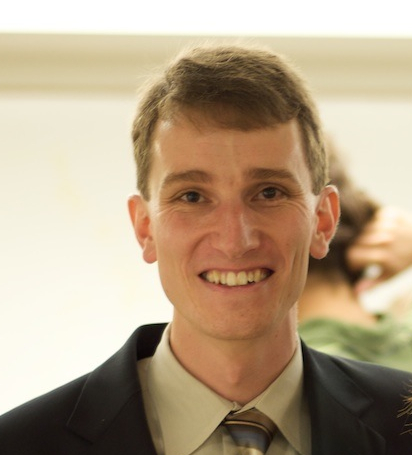 In addition, Professor Kyle M. Shen (Cornell) writes in a letter published in Science about the work of Steppke et al. as well as about the value of uniaxial strain tuning as a valuable new tool in the physicists toolkit. All in all, it is looking like uniaxial strain tuning has become one of the most promising routes to making high profile advances in the field of strongly correlated electron systems. Happy Christmas from Sean, Jack, Alex and Echo. Thank you to all our supportive customers who have allowed us to grow the company and focus on bringing more quality products to market. Thanks everyone and enjoy your time off!